Veterans Day speakers at the National Japanese American Memorial to Patriotism (from left): Lt. Col. Michael Yaguchi, USAF (retired); JAVA President Gerald Yamada; former Transportation Secretary Norman Mineta; Michael Cardarelli of the Department of Veterans Affairs; and NJAMF Board Chairman Daniel Matthews. WASHINGTON — Nov. 11 was a very busy and rewarding day for members of the Japanese American Veterans Association. 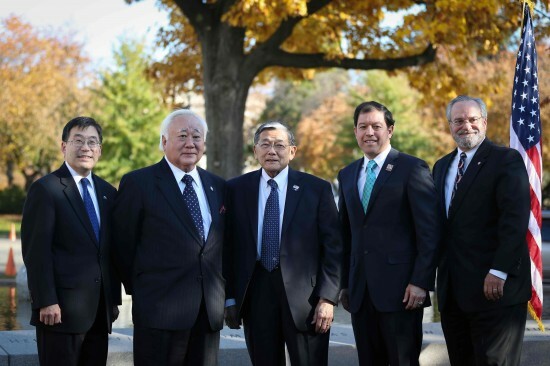 JAVA partnered with the National Japanese American Memorial Foundation and the Pan Pacific Leaders and Mentors for the 11th annual Veterans Day event at the National Japanese American Memorial to Patriotism in World War II in Washington, D.C.
JAVA President Gerald Yamada, NJAMF Board Chairman Daniel Matthews, and PPALM Executive Director Lt. Col. Michael Yaguchi, U.S. Air Force (retired) each shared a few thoughts with the audience before the keynote address was delivered by Michael Cardarelli, principal deputy undersecretary for benefits at the Department of Veterans Affairs. Carderelli, a retired Army colonel, paid homage to the “giants” who served heroically in previous conflicts, and honored the exceptional service of those serving today. Earlier in the morning, JAVA helped prepare for and participated in Veterans Day events at the White House and Arlington National Cemetery as an associate member of the Veterans Day National Committee. JAVA was represented at the White House Veterans Day Breakfast, held in the East Room, by Executive Committee members Hollywood, and Lt. Col. Kay Wakatake, U.S. Army, who joined other members of the committee and invited guests. After breakfast, they met with President Barack Obama, Vice President Joe Biden, and their wives. The midday ceremony at Arlington, sponsored by DVA, was a major event for the nation as well as JAVA. Commanders of Veterans Service Organizations, including Yamada, witnessed Obama laying the national wreath at the Tomb of the Unknown. VSO commanders then moved to the Amphitheater, where each commander was recognized by name over the public address system and they viewed the parade of colors, including Lt. Col. Allen Goshi, U.S. Army, and Korean War veteran Chosei Kuge carrying the flags of the U.S. and JAVA, respectively.